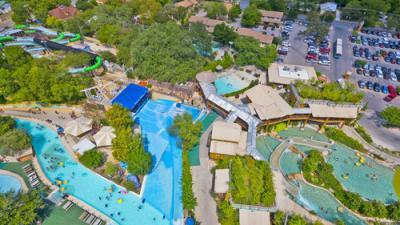 Because of the dry, hot Texas climate, it's no wonder that outdoor water parks are incredibly popular attractions there. From wild parks with dozens of slides to smaller facilities with calm pools and picnic areas, there are water parks throughout the state, with locations in major cities, suburbs and popular vacation spots. From gentle waves and non-existent currents to ferocious tidal forces in the most advanced water thrill rides, there are many options at different outdoor water parks. There are four Schlitterbahn water parks in Texas. Schlitterbahn, which means "slippery road" in German, has become synonymous with crazy water slides and innovative wet attractions, and all Schlitterbahn Parks deliver amazing ways to cool off. Not surprisingly, Schlitterbahn Parks have been racking up awards since the early 1990's, including World's Best Waterpark and TripAdvisor Certificate of Excellence. Schlitterbahn New Braunfels: The original Schlitterbahn park in New Braunfels, near San Antonio, opened in 1979 and today encompasses 65 acres of aqua-tastic excitement. Frequently rated among the top water parks in the United States, this destination features more than three miles of water slides, seven children's play areas, three water coasters, giant hot tubs for adults, a massive wave pool, a surfing simulator pool, and more. Schlitterbahn South Padre Island: With a tropical theme, this park on South Padre Island overlooking the Gulf of Mexico has been a popular southern destination since it opened in 2001. Attractions include the Rio Aventura endless river that connects major rides, the five-story interactive sandcastle playground, the world's largest surfing machine, four unique water coasters, and a wave pool. A small portion of the waterpark features several indoor slides, but the majority of the park is outdoors. Schlitterbahn Galveston Island Waterpark: This 15-acre park features gigantic hot tubs with swim up bars, family raft slides, water coasters, enclosed tube chutes, and speed slides that drop from a dizzying eight stories up. There is shaded seating throughout the park, and private cabana rentals are located within the Blastenhoff area. The Wasserfest area of the park is its most significant innovation; it can be enclosed to become a 70,000 square foot indoor water park during the cold winter months. Schlitterbahn Upper Padre: This is the newest of the Schlitterbahn properties in Texas and is opening in phases. Currently, this new Corpus Christi park includes a river system, kids area, tube chutes, beaches, and a swim up bar. While the Schlitterbahn parks have an impressive presence in Texas, they are far from the only ones. Visitors interested in wild and crazy splashes can try out any of the state's amazing outdoor water parks with high-tech thrills and speedy drops. Six Flags Hurricane Harbor: This tremendous water park in Arlington (also in the DFW metro) offers guests a range of slides, including family rafts, dark slides, a tornado funnel slide, nearly perpendicular speed slides, and terraced pools connected by gentle sloping slides. The park has other classic water park thrills such as water cannons, nets, a wave pool, and a carpeted tanning area. Hawaiian Falls: There are five Hawaiian Falls water parks located in the Dallas-Fort Worth (DFW) metro, as well as locations in Waco and Pflugerville. These parks have exciting rides and attractions that embody the tropical essence of Hawaii. While each park is unique, familiar attractions include wave pools, four-person racing slides, lazy rivers, speed slides, wacky half-pipes, children's activity areas, cool water walkways, and private cabanas for the ultimate in relaxation. NRH2O: This thrilling park in North Richmond Hills (in the DFW metro) features a four-lane mat racing slide, three serpentine body slides, double tube slides, and a five-level interactive activity area for all ages. There's also a lazy river, and themed children's play areas with climbing nets, balancing pads, and other wet surprises. All-day private cabana rentals are available to beat the heat. Aquatica: A part of SeaWorld San Antonio, this water park lets guests become part of the aquatic environment with cool attractions like Roa's Aviary, where guests can float or wade down the river through a 13,500 square-foot aviary with over 50 species of birds. Look for thrill rides like Stingray Falls, a one-of-a-kind ride that takes you down twists and turns to an underwater grotto where you get to see stingrays and tropical fish. White Water Bay: This San Antonio water park is included with admission to Six Flags Fiesta Texas. It includes such drippy attractions as family slides, a gigantic Texas-shaped wave pool, multi-rider slides, and a funnel slide. Visitors interested in some watery fun of a more moderate degree will enjoy a variety of mid-range water parks. Castaway Cove: Located in Wichita Falls, this tropical-themed park has everything for vacation castaways to enjoy, including a tunnel tube slides, a wave pool, a lazy river, the Buccaneer Bay interactive play area, speed slides, and a sand volleyball court. Splash Kingdom Family Waterparks: The family-friendly Splash Kingdom park in Canton features ten acres of splashy fun, including speed and tube slides, a lazy river, a castle-themed water fortress for youngsters, a wave pool, and more. Glow-in-the-dark miniature golf is a fun dry activity, and plenty of snacks are available. If you're looking for something more adventurous, check out the Splash Kingdom Wild West park in Hudson Oaks. There is also a new Splash Kingdom Family Waterpark in Nacogdoches, Texas. For cool thrills in a low-key environment, these Texas water parks fit the bill. Texas Water Rampage: This Lubbock park features water volleyball, a 9,000 square-foot wave pool, a few thrilling slides, a children's play area, and picnic areas. Pirates Cove is the newest attraction, and Texas Water Rampage is looking to expand in 2016. Burger's Lake: Near Fort Worth, this simple 30-acre park is highlighted by a spring-fed lake with six diving boards and a water trapeze. The abundant picnic tables and no-alcohol policy make it a great family destination for a cool afternoon. With all the options for cooling enjoyment, there is no reason visitors to Texas should have any concerns about beating the summer heat. In addition to the parks listed here, there are also a number of indoor water parks in the state you may want to visit. With such a mix of crazy water attractions, depth-defying slides or just cool, watery fun, the water parks in Texas have it all.